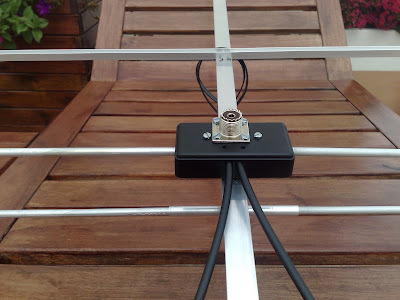 I wanted to build a Yagi antenna so that I could point it at the balloon and track it from the ground. Apparently, VHF propagation improves hugely with height so, if the balloon is high enough, even a low-gain omni antenna will pick it up. 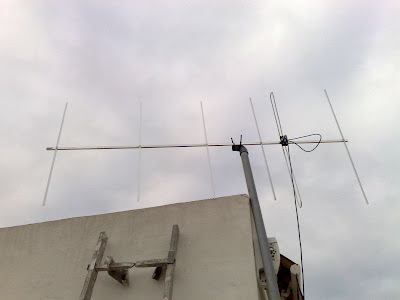 I did, however, not want to leave anything to chance, so I built the yagi even though I might not need it. 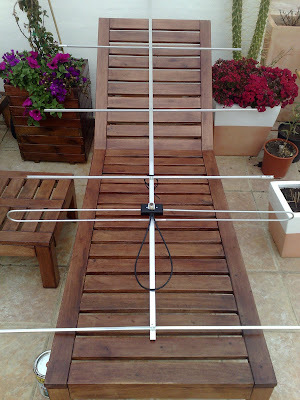 I used this great Yagi Calculator by John VK5DJ to design the antenna. The author says that the program is meant for long antennas (over 10 directors), but mine has 4 directors and it works great. Here are the ingredients. This shouldn't be more than 10€ provided you have basic tools. 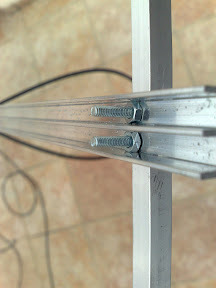 5 square aluminum rods (1m long, 8x8 mm section) for the directors and the reflector. The cross section looks something like this: |_| (ie, one of the sides of the square is missing). I guess I could use fully squared rods, but they would be heavier. 2 round, hollow rods (1m long, 6 mm thick) for the radiator. I think hollow ones are easier to bend, and lighter too. 1 round, hollow rod (1m long, 8mm thick). 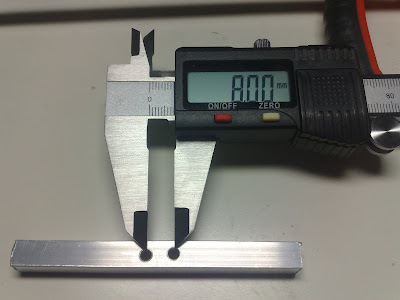 The 6mm rod must fit into the 8mm rod. 3 mm machine screws of different lengths to hold everything in place, bolts and washers. 1 SO-239 female connector (aka PL connector). 1 plastic / prototyping box. 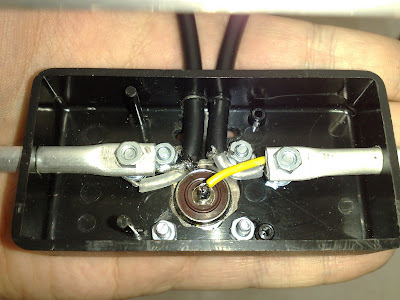 This will contain the SO-239 connector, the balun and the connections with the dipole. Any bottle that is 50mm across. Any aerosol can, deodorant spray, sun-tan lotion bottle, etc will work. I used it to bend the rod. First, I tried to bend the rods. I feared they would collapse or they'd be too stiff, but they bent just fine. I just put the rod on the kitchen counter, right next to the wall. I held the aerosol can firmly, pushing down and against the wall, and bent the overhanging end of the rod around the can. The wall keeps the other end still, so you only need to focus on holding the aerosol with one hand and bending the rod with the other. It works pretty well, of course there are more sophisticated methods. Next, I cut the square rods to their lengths. I labeled them D1, D2, D3, D4 and R. I used one of the leftover pieces and drilled two holes 8mm apart on it, so that I could use it as a pattern. Then, I used that pattern to drill the holes on the boom, the directors and the reflector. I actually had to build a couple more patterns, since after a few drillings, the holes grew wider. Anyhow, this is the hardest part since the holes on the boom and the elements must match. After drilling the holes, I put all the elements in place. I like this part since the former bunch of scrap starts to look like an actual antenna! 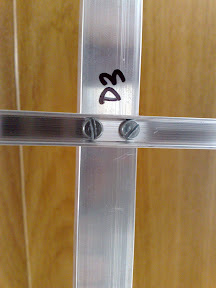 First, I drilled two 6mm holes on the sides of a plastic box I had around. 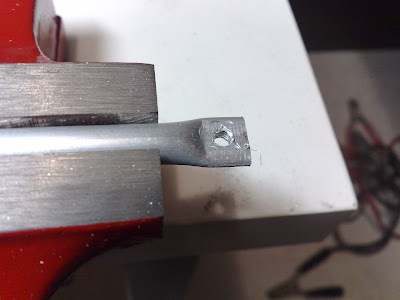 Then, I flattened the ends of the dipole that go inside the box, and drilled 3mm holes through them (it's much easier when the rod is flat). Now the flat part won't fit in the 6mm holes of the box, so you'll have to mount them the other way around, ie. introducing the round end from the inner side of the hole and pulling all the way. It's kind of hard to explain, but it will become obvious when you face the problem. 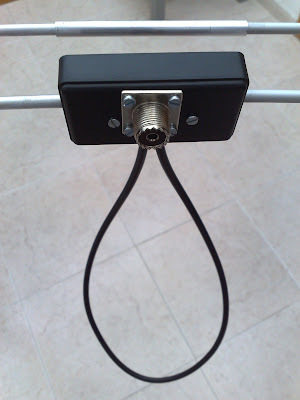 As you can see in the picture above, the dipole ends are hooked to a couple of two long 3 mm screws. The cables are clamped with washers and bolts, so I didn't use any solder except on the pin of the SO-239 connector. The whole thing looks like: bolt, washer, cable, washer, bolt, flattened rod, bolt. To keep the box in place, I drilled two more holes. I used the same 8 mm pattern above. I just took care of not shorting the boom with the radiator by making sure the mounting screws don't touch anything else in the box.